There is often talk of new year’s resolutions being token efforts to soothe the soul in its discomforting failure to let bygones be bygones and start afresh. But this time the turn of the year seemed to have indeed taken the rough edges off the conflict. Late December 1980, there looked to be no hope for the future of Grand Prix racing but in January 1981 there was a new constructive spirit to at least try to move on. Or was it simply because one side had been irreparably weakened? 1 -- In application of the decisions taken during the FIA Rio Congress of 15th April 1980, the FISA is organising the new FIA Formula 1 World Championship from 1st January 1981. As a result, the old World Championship for Drivers is suppressed. 2 -- The new Formula 1 World Championship, which is the property of the FIA, will have 2 World Championship titles, one for Drivers and one for Constructors. 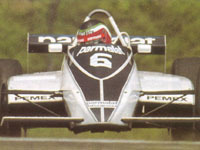 These significant lines had been Balestre’s key weapon all through 1980, as he tried to oust the FOCA from its control of Grand Prix racing, the old-school concept in which Grands Prix were the starting point, each of them negotiating invididually with their entrants, with the World Championship the mere afterthought of combining a number of prestigious races which happened to be eligible to FIA regulations which didn’t even need to be F1. The old World Championship which would be ‘suppressed’ was in fact nothing else but a collection of self-governed races appointed by the FIA to hold World Championship status, which allowed anyone else to stage an F1 race which wasn’t included in the championship. Now though, the 1981 championship would fully be a FIA affair, as Grand Prix racing became synonymous with the F1 World Championship. All teams would have to take part in all events on the championship calendar, and the FIA would determine the rules – with each Grand Prix’s supplementary rulebook replaced by a standardised set of rules – and it would set the entry and prize monies too. ‘Non-championship’ races were to become a thing of the past as the FIA F1 World Championship events would be the only races allowed to run according to F1 regulations. As a result, the FOCA would be entirely out of it. That is, until the manufacturers and the FOCA starting talking again. The moment was mid-January, the location was Maranello, home to Italy’s demi-God, who could be operatically opposed to the garagiste effort and at the same time very practically inclined to deal with the English spannermen in a way which suited him – it was to be the perfect ‘opposites-attract’ combination that allowed Ecclestone and Mosley to talk the FOCA back into the frame. The resulting Maranello Agreement would lay the ground work for the Concorde Agreement that went on to settle the argument two months later. Which doesn’t mean that FISA and FOCA were happy campers from the moment the Maranello Agreement was struck. With the Argentinian race now definitely postponed the FISA continued to badger the South African organisers, telling them that they couldn’t have a World Championship event if they wanted to go ahead with their race in February. The FISA even suggested the South Africans that they organise a Formula Libre race if they wished so. Probably to FISA’s surprise the South Africans decided to press ahead with their early-February race and indeed turned it into a Libre race. After all, they had made promises to their event sponsor Nashua and felt they had a signed FOCA agreement to honour. And a Libre race it would be, as the FOCA teams appeared with sliding skirts, which meant that their cars fell foul of the 1981 F1 regulations. In a peculiar deal through Ecclestone’s International Racing Tyre Services (IRTS) company even the products of Goodyear re-appeared on the track while the Americans had actually withdrawn from Grand Prix racing! So technically, the 1981 South African GP was never a Formula 1 race to begin with. With the Long Beach date looming both manufacturers and garagistes were now in a hurry to sort things out, although Balestre was still using all his blocking tactics. However, the process was suddenly speeded up by Renault shooting a hole in FISA’s defenses. In those days the French company was the owner of American Motors and because of this affiliation it made it known to the FISA that it was unhappy to skip the Californian race. So mid-February, Renault announced that it would be at Long Beach, with or without Balestre. Then the hole became bigger when Ferrari opportunistically decided to race at Long Beach as well, and not for long Alfa and Talbot followed suit. It was a drastic turn of events. Within days, Balestre went from trying to bully the SCCA – Long Beach’s sanctioning body on behalf of ACCUS – into taking its hands of the race or risk the manufacturers not taking part to being ‘betrayed’ by one of his most loyal partners. So was it a New Year’s resolution that eventually mellowed him into accepting the terms of the Concorde Agreement? No, it was the lack of support from the manufacturers. First it was Enzo Ferrari’s mid-January invitation to the FOCA to come to Maranello to sort things out with Ferrari and Renault. Then the FOCA rammed home their point by staging their pirate race in South Africa. It wasn’t just to annoy Balestre. Foremost they did it – on their last financial reserves – to show to the manufacturers that their teams were well able to stage a race of World Championship quality on their own. It was a master stroke but the teams wouldn’t have been able to afford a second try… Fortunately for them, Balestre then made the tactical mistake to use his allies as a bargaining tool with the SCCA, and when Renault found out they announced they weren’t going to play with the FISA anymore. Balestre’s bluff had backfired on him. There was no way back for him now. He had refused to sign off the Maranello Agreement on February 8, objecting to the number of FOCA members in the new-style F1 Commission that was part of the agreement, and when that issue was fixed on February 20, on the back of Balestre’s Long Beach gaffe, he still wouldn’t sign. He now demanded that the FOCA withdraw the injunctions that ordered the FISA to stop interfering with the contracts the FOCA had signed with the organisers. Ecclestone promised that he would do so if Balestre gave his word that he would sign. Even Balestre could see now that the manufacturers and the independent constructors had done a deal that he could do nothing about, and he agreed. So finally, on March 11 – four days ahead of the Long Beach GP – the FISA, the manufacturers and the FOCA teams reached a tenable truce when they signed the infamous Concorde Agreement. The document – which was in fact the Maranello Agreement but renamed on the request of Balestre – was the work of Max Mosley doing his clever-lawyer bit, helped by Ferrari’s team manager Marco Piccinini, Renault lawyer Ronnie Austin and a FIA lawyer, to have both FISA and FOCA come out as winners. Critically, Piccinini’s fluency in French helped the parties to settle their terms as the Ferrari man reported their progress to Balestre. In an even smarter move, it was decided not to disclose the precise contents of the Concorde Agreement, in spite of Balestre’s earlier hullabaloo about transparency and public governance. The FISA won because the ‘packaged’ series of events forming the new FIA F1 World Championship was kept alive and acknowledged by all parties. Teams had to lodge an entry for the entire package instead of cherry-pick their events. They also accepted the new 1981 regulations in full, which meant that sliding skirts were now dead and buried. Furthermore, the FISA was to have total control of the technical regulations. The FOCA won because it became the sole commercial negotiator for the entire package. The teams would also receive their share of the television money and there would have to be unanimous agreement on future technical changes. The flat-bottom and smaller fuel-cell regulations were postponed to the end of the Concorde Agreement on December 31, 1984. As an interesting detail the ban on four-wheel drive and six-wheelers was lifted (but only momentarily, as we will later find out). The manufacturers were pleased as well. The threat of a breakaway series was averted, the FIA would be making the rules, and they too would receive a bigger slice of the pie – and it was them after all who made the first move towards peace. The new F1 Commission was a reflection of this. The manufacturers would have three representatives, as would the FOCA. The organisers would get four votes – two European events and two overseas races, appointed by the FIA – while the sponsors would get two – one from the manufacturer camp and one from the FOCA ranks. The reigning World Champion would be a non-voting member while the FISA would have the final vote. The FIA Executive Committee was given the right to refuse the commission’s proposals but was crucially denied the right to alter them. It was as if the pieces of the puzzle, which had been lying around all over the floor in 1980, now suddenly fell into place. The irony was that Balestre’s master stroke at Rio, originally designed to kill off any remaining aspirations of the FOCA, now became the foundation on which Ecclestone would be allowed to build his empire. Would he have been as phenomenally rich as he is today if Balestre hadn’t turned the F1 World Championship into a packaged series? It’s precisely that which made F1 racing perfect for the television age. It also fitted in with Bernie’s cry for more professionalism – which eventually came in spades, as he got rid of almost of all the remaining local idiosyncrasies that turned Grands Prix into unique events. All races are now run on Sundays, on identical time schedules, on tracks looking increasingly similar. Today, it’s almost a surprise to see the Monaco GP winner still step out of his car to immediately receive the trophy from the hands of the Monegasque head of state. How long before that quirky ritual is replaced by the standard rostrum ceremony? There had to be a piece that had to be bent in shape in order to fit. In other words, who were the losers? It couldn’t be anyone else but the organising clubs. Although they got a vote in the F1 Commission, they now had to deal with the FOCA as they did before but now in the knowledge that had nowhere to go to with their complaints. This was because of a crucial part of the Concorde Agreement stating that the FIA was only allowed to grant an event World Championship status after the FOCA had agreed terms with its organisers. If there was one sharp contrast with the state of affairs in the sixties – which is where this series of articles came in – it was between the erstwhile might of the organisers and their post-Concorde lack of power. Some might not have understood why Balestre allowed this to happen but it is said that he planned for the contracts to come back to him after their four-year period had run out and take full control again. He was sure that the organisers would become disappointed with Ecclestone’s hard bargaining, just as had been the case in the seventies. In the end, the commercial growth of the sport, so cleverly managed by Ecclestone, prevented the Frenchman’s dream from happening. The Concorde Agreement allowed the Long Beach GP to go ahead in peace and calm. There was more irony involved here, as the FIA’s first race of the new era was in fact the traditional FOCA event that Balestre had so vigorously tried to stop two months before. Peace and calm was nowhere to be found within FOCA ranks, however. With the ink of the Concorde Agreement only just dried, ten teams fiercely protested Colin Chapman’s revolutionary twin-chassis Lotus 88. On the background but not protesting himself, Ecclestone led their challenge and found an unexpected ally in the FISA, which declared the Lotus illegal because its ‘second chassis’ was deemed to be a moving aerodynamical part. Balestre made his personal involvement known by stating that the car didn’t break any regulation as such but that its design was acting against the spirit of the rules. The car was blackflagged for a second time in the Argentinian GP and while Lotus fought on in the Court of Appeal – where it lost – the car wasn’t seen again until free practice for the British GP. There, Chapman had found support from the RAC which had no qualms in approving the car’s B-spec. It was immediately protested by the manufacturers and several FOCA teams, after the which the FISA ruled that relocating a radiator did not change the 88B sufficiently from the 88 that had already been banned by the same body. And so it was disallowed to race, forcing Chapman to fall back on his traditional 87s. In hindsight, it’s easy to interpret Ecclestone teaming up with Balestre as a shrewd move to pave the way for his own, equally illegal, Brabham BT49C. That car, too, didn’t break any rules as such but its innovative hydraulic suspension was just as much against their spirit. Designer Gordon Murray’s brilliant ploy allowed the driver to lower the car with the flick of a switch inside the cockpit, allowing it to use its legal fixed skirts for ground effects while it went back to legal 60mm ride height for scrutineering. Piquet lost out in Brazil after a bad tyre gamble but in Argentina the car was two seconds faster than its nearest Cosworth-powered rival, the FW07C, bettering Prost’s turbo-powered Renault times on his way to an imperious pole and win. Its huge advantage was underlined by journeyman Hector Rebaque rising up to second place before retiring with ignition problems. In Brazil and again in Argentina, Frank Williams tried to rally his colleagues to back his protest against the Brabham but to no avail, but only Renault followed. Most of the others – including Arrows, Fittipaldi, Osella and Tyrrell – had been working on their own systems of which the first crude version appeared at Imola. Even Williams had developed a similar system by then. In contrast, other loopholes such as flexible skirts (on the back of the wrong wording in Concorde Agreement, stating that skirts must be solid instead of rigid), adjustable wing endplates and closed-off bodywork between the rear wheels and sidepods were dealt with swiftly by the FISA. When Balestre made no move to ban the hydropneumatic system – and in fact legalised it from the Belgian GP on – the other teams quickly adopted it. What else could they do? The post-Imola solution developed by the F1 Commission had been a blatant attempt at keeping the peace. From now on, scrutineers would be happy measuring the static machines with their 60mm rideheight, well in the knowledge that the cars would be illegal as soon as they left the pits. Now it was simply a matter of having your pneumatic dampers actually work, as Alan Jones found out when he lost his Zolder pole time after his dampers failed to lift the car at one side! Several teams also worked around the increased weight limit by mounting lead rear wings. These lightweight qualifying specials were used well into 1982 as a means for the Cosworth-powered teams to keep up with the turbo cars instead of qualifying four or five seconds adrift, which would have been the natural gap. All this turned the whole 1981 season into The Great Irony. The season was run to the 1981 regulations that Balestre had fought for so hard, but the FOCA teams simply dodged them by running blatantly illegal cars – and Balestre allowed them to get away with it. Here were cars that were even more effective in using their skirts, going through corners at even higher speeds, and yet all was fine and dandy. The season made the point very well that the FISA-FOCA war had only used technology and safety as its ammunition but that in the end it wasn’t about technology or safety at all. It was about power and the main protagonists were enjoying big chunks of it right now. At the end of 1981, Balestre was back on top of the world as he did away with the 60mm rule and Gordon Murray’s ‘automatic ride control’. Ecclestone, meanwhile, had dug in from the wrath of the other teams and especially Enzo Ferrari who felt betrayed after his efforts to come to the Maranello Agreement. But the Brabham team boss remained ever practical. He gathered that the other teams would need at least four or five races to sort their rideheight systems, by which time his driver would be close to the team’s first drivers title.